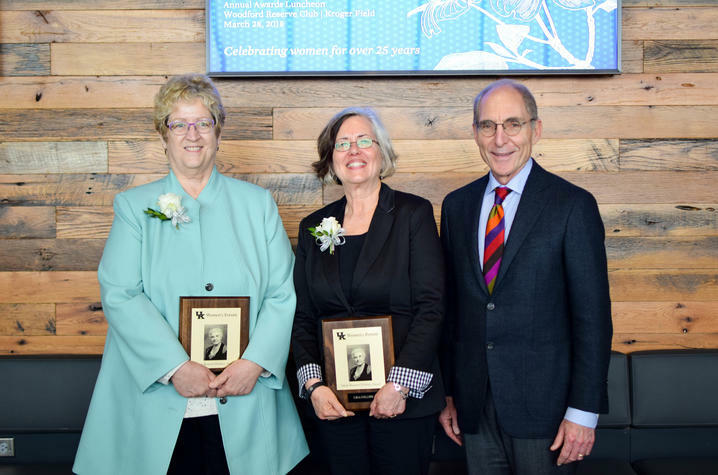 The 2018 Sarah Bennett Holmes Award winners Debra Moser of the College of Nursing and Lisa Collins of the College of Agriculture, Food and Environment with UK President Eli Capilouto. Photo by Sarah Caton. LEXINGTON, Ky. (Feb. 25, 2019) — The University of Kentucky Women's Forum has announced the 12 women who have been nominated for the 2019 Sarah Bennett Holmes Award. Established in 1994, the Sarah Bennett Holmes Award honors a distinguished former dean of women at the University of Kentucky. Sarah Bennett Holmes, who was widowed at a young age, raised four children while completing her own education. She went on to have a successful career at UK where she inspired young women to persevere in the face of hardship and pursue their career goals. Among her accomplishments, Holmes developed work programs for women during the Depression. The award is granted annually to women working at UK who promote the growth and well-being of other women at the university and across the Commonwealth. Two awards will be presented — one to a faculty member and one to a staff member. The UK Women’s Forum invites the campus to attend the annual award ceremony and luncheon at 11:30 a.m., Wednesday, March 27, at the Gatton Student Center Ballroom. Cost is $15 per individual, or departments/offices can purchase a table of eight for $120. Please visit the UK Women’s Forum website to register and for information regarding payment. The registration deadline is March 19, 2019.